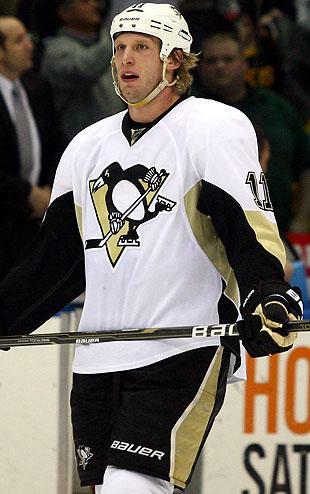 "People read the newspapers and so maybe they think he's available," Shero said. "That stuff is all speculation. I have made it clear to every team that has asked. I don't want to trade Jordan. I'm not listening to offers. I want Jordan here. I want him here for a long time, and that's what I'm going to try to do." Writer Josh Yohe speculated that Shero's public loyalty to Staal might be "a tactic used to increase possible trade value." Within that context, Thursday's news seems timed rather interestingly: TSN's Bob McKenzie and Darren Dreger are reporting that Staal turned down a 10-year contract extension from the Penguins. The news was confirmed by both the Tribune-Review and the Post-Gazette in Pittsburgh. Via Lyle Richardson, Dreger is reporting it may have been a $60 million deal. The cap hit's significant, given that the Penguins will have to sign Sidney Crosby by Summer 2013 and League MVP Evgeni Malkin in Summer 2014. This doesn't sound like Staal wants out of Pittsburgh specifically. It sounds like he doesn't want to sign with any team because he wants to see what the market will offer him. Or maybe he wants a short-term contract and the Penguins want to sign him long-term. However, if he doesn't re-sign, the market will likely offer him A LOT which would effectively put the Pens out of the running to sign him as a UFA. Dave Molinari of the Post-Gazette reiterated that the contract rejection wasn't an indication Staal didn't want to stay in Pittsburgh, but rather a way to "keep options open." You know: Options for eventually leaving the shadow of Sid and Geno, for example.